Species reintroductions can be hotly contested issues because they can negatively impact other species, ecosystems, and society, as well as failing, altogether. The uncertainty of their outcomes forces stakeholder groups to form their own opinions on whether it’s a good idea to proceed with a reintroduction. When you have several groups with conflicting values and views, managers need to focus on the information most important for them to make a well-informed decision on whether to pursue a reintroduction. As researchers, we can play an important role by carefully considering and addressing these views through our research, if the appropriate data is available. Despite being in the early days of our study on the potential sea otter reintroduction to Oregon, we have already heard several perspectives regarding its potential success, the type of research we should do, and if sea otters should be brought back to Oregon. Here, I present some of the most interesting and relevant opinions, perspectives, and theories I’ve heard regarding this reintroduction idea. The first reintroduction failed because of X, Y, and Z. From 1970-1971, managers translocated 93 sea otters to Oregon in a reintroduction effort (Jameson et al. 1982). However, in a matter of 5-6 years, all sea otters disappeared, and the effort was considered a failure. Researchers have theorized that sea otters left Oregon due to a lack of suitable habitat and prey, or to return home to sites from which they were captured. 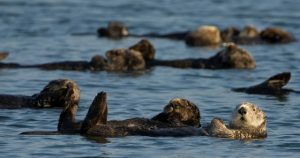 Others have reasoned that managers should have introduced southern sea otters instead of northern sea otters, suggesting one subspecies’ genetic pre-disposition may improve their chance for survival. Knowing the reasons for this failure may help managers avoid these causes in a future reintroduction attempt and increase its chance of success. We, as scientists, can also gain insight from knowing these causes because this may help us better tailor our research to potentially investigate whether those causes still pose a threat to sea otters during a second attempt. Unfortunately, we lack concrete evidence on what exactly caused this failure, but we can still work to test some these theories. An otter is an otter, no matter where you put it. There is evidence that northern and southern sea otters are genetically distinct, to a certain degree (Valentine et al. 2008, Larson et al. 2012), and hypotheses have been put forward that the two subspecies may be behaviorally- and ecologically-distinct, too. Studies have shown that northern and southern sea otters have different sized and shaped skulls and teeth, which researchers hypothesize may be a specialized foraging adaptation for consuming different prey species (Campbell & Santana 2017, Timm-Davis et al. 2015). This view suggests that each subspecies has developed unique traits to adapt to the environmental conditions specific to their current ranges. 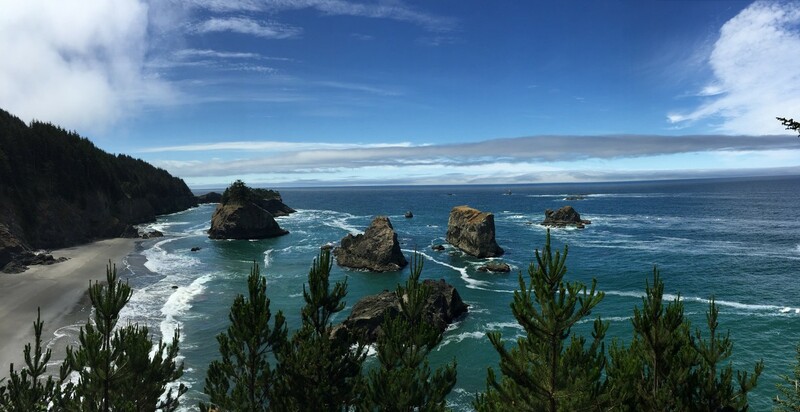 Therefore, when considering which subspecies to bring to Oregon, managers should reintroduce the subspecies with traits better-suited to cope with the types of habitat, prey assemblages, and oceanographic conditions specific to Oregon. However, other scientists hold the opposite view, and argue that “an otter is an otter” no matter where you put it. This perspective suggests that both subspecies have an equal chance at surviving in any type of suitable habitat because all otters behave in similar ways. Therefore, ecologically, it may not matter which subspecies managers bring to Oregon. Oregon doesn’t have enough sea otter habitat. Kelp is considered important sea otter habitat. In areas with high sea otter densities, such as central and southern California, kelp forests are persistent throughout the year. However, in Oregon, our kelp primarily consists of bull kelp – a slightly more fragile species compared to the durable giant kelp in California. In winter, this bull kelp gets dislodged during intense storms, resulting in seasonal changes in kelp availability. Managers worry that this seasonality could reduce the amount of suitable habitat, to the point where Oregon may not be able to support sea otters. Yet, we know sea otters used to exist here; therefore, we can assume there must have been some suitable habitat that may persist today. Furthermore, sea otters use a range of habitats, including estuaries, bays, and reefs (Laidre et al. 2009, Lafferty & Tinker 2014, Kvitek et al. 1988). Therefore, even during times when kelp is less abundant, sea otters could use these other forms of habitat along the Oregon coast. Luckily, we have the spatial tools and data to assess how much, where, and when we have suitable habitat, and I will specifically address this in my thesis. Sea otters are famous for their voracious appetites for benthic invertebrates, some of which are of commercial and recreational importance to nearshore fisheries. 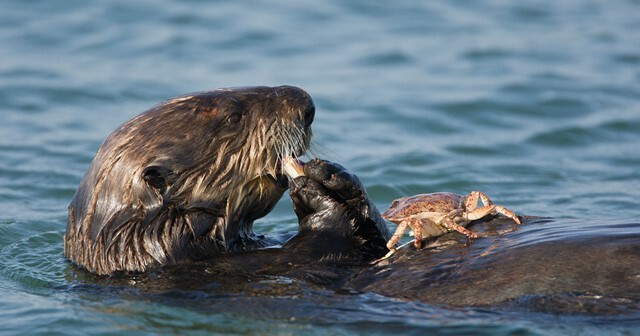 In some cases, sea otters have significantly reduced prey densities, such as sea urchins and Dungeness crab (Garshelis & Garshelis 1984, Estes & Palmisano 1974). However, without a formal analysis, it’s difficult to know if sea otters will have similar impacts on Oregon’s nearshore species, as well as at spatial scale these impacts will occur and whether our fisheries will be affected. We can predict where sea otters are likely to occur based on the presence of suitable habitat, but foraging impacts could be more localized or widespread across sea otter’s entire potential range. To better anticipate these impacts, managers will need an understanding of how much sea otters eat, where foraging could occur based on the availability of prey, and where sea otters and fisheries are likely to interact. I will also address this concern in my thesis. To reintroduce or not to reintroduce? That is the question. I have found that many scientists and managers have strong opinions on whether it’s appropriate to bring sea otters back to Oregon. Those who argue against a reintroduction often highlight many of the theories already mentioned here – lack of habitat, potential impacts to fisheries, and genetics. While other opponents provided more logistical and practical justifications, such as confounding politics, as well as difficulties in getting public support and regulatory permission to move a federally-listed species. In contrast, proponents of this idea argue that a reintroduction could augment the recovery of the species by providing additional habitat for the species to rebound to pre-exploitation levels, as well as allowing for increased gene flow between southern and northern sea otter populations. Other proponents have brought up potential benefits to humans, such restoring ecosystem services, providing an economic boost through tourism, or preserving tribal and cultural connections. Such benefits may be worth attempting another reintroduction effort. As you can see, there are several opinions and perspectives related to a potential sea otter reintroduction to Oregon. While it’s important to consider all opinions, managers still need facts to make key decisions. Scientists can play an important role in providing this information, so managers can make a well-informed decision. Oregon managers have not yet decided whether to proceed with a sea otter reintroduction, but our lab is working to provide them with reliable and accurate science, so they may form their own opinions and arrive at their own decision. Estes, J. A. and J. F. Palmisano. 1974. Sea otters: the role in structuring nearshore communities. Science. 185: 1058-1060. Garshelis, D. L. and J. A. Garshelis. 1984. Movements and management of sea otters in Alaska. The Journal of Wildlife Management. 48: 665-678. Jameson, R. J, Kenyon, K. W., Johnson, A. M., and H. M. Wight. 1982. History and status of translocated sea otter populations in North America. Wildlife Society Bulletin. 10: 100-107. Kvitek, R. G. ,Fukayama, A. K., Anderson, B. S., and B. K. Grimm. 1988. Sea otter foraging on deep-burrowing bivalves in a California coastal lagoon. Marine Biology. 98: 157-167. Larson, S., Jameson, R., Etnier, M., Jones, T., and R. Hall. 2012. Genetic diversity and population parameters of sea otters, Enhydra lutris, before fur trade extirpation from 1741-1911. PLoS ONE. 7(3). Timm-Davis, L. L, DeWitt, T. J., and C. D. Marshall. 2015. Divergent skull morphology supports two trophic specializations in otters (Lutrinae). PLoS ONE. 10(12). Valentine et al. 2008. Ancient DNA reveals genotypic relationships among Oregon populations of the sea otter (Enhydra lutris). Conservation Genetics. 9:933-938. Next Next post: How to apply my PhD?